So, the detail, I arrived Tuesday morning to be promptly greeted by a power cable being lowered down from a third floor flat. For some reason a Brothers Grimm fairy tail sprung to mind, unfortunately it there was not a beautiful maiden at the other end :DFirst sight of the car showed it to be reasonable tidy but still in need of an Xd a deep clense. So I started with a hot rinse to remove any dust off the car then I applied liberally some heavy-duty traffic film remover to dissolve any wax and tar that had attached itself to the paint. This was then followed by a snow foam to emulsify the gunk on the car followed by a hot rinse. Now I had removed the bulk it was time for the sheepskin wash mitt and some hot soapy water. Followed again by another rinse and a blow dry, yes you did read right a blow dry. The idea is to minimise any mechanical contact you have with the paint to reduce the chance of adding swirls into the paintwork. Blow-drying the car means that you are not rubbing the cars paintwork to dry it so reducing the chance of swirls. 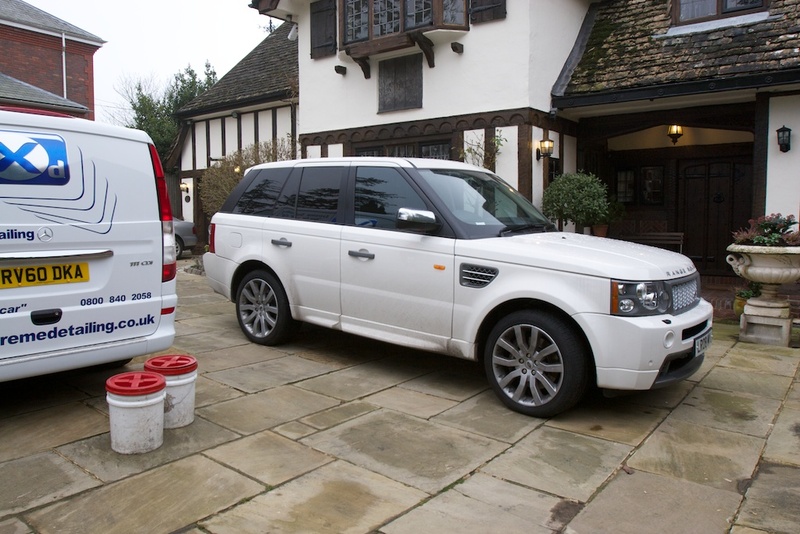 Started a new project this week from one of my regular customers it was time for his Range Rover Sport to have a major spruce up ready for spring. A week later I had picked up the keys ready for his car to be detailed whilst he was abroad on business. The car is to be cleaned thoroughly then polished, sealed and protected. Also the alloys are to be sent off and refurbished. Everything then to protected using the GTechniq range.